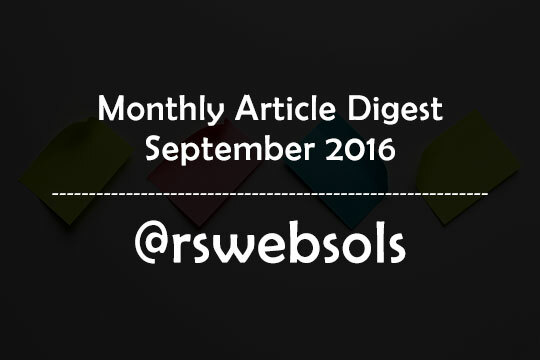 This is an article containing the monthly article digest of the month “September 2016” at RS Web Solutions (@rswebsols). You can easily find all our published articles of September 2016 in a ascending order by date. This is a monthly archive page to help our readers to give an easy-to-find list of monthly articles. Along with the article title, you can also able to read a short excerpt of each article. If you find an interesting article that catches your attention, you can, of course, click on the “continue reading” link to read the entire article. Happy reading! This is an article containing the monthly article digest of the month “August 2016” at RS Web Solutions (@rswebsols). You can easily find all our published articles of August 2016 in a ascending order by date. This is a monthly archive page to help our readers to give an easy-to-find list of monthly articles. Along with the article title, you can also able to read a short excerpt of each article. If you find an interesting article that catches your attention, you can, of course, click on the “continue reading” link to read the entire article. Happy reading! 24) How Android Developers Changed The World of Mobile? 25) Pros & Cons of Wireless Security Systems Over Their Wired Counterpart? 33) Oberlo App for Shopify – Start your Drop Shipping Business Today! 36) Android vs. iOS: Which One Owns a Better App Permissions System? 42) Evoplus Q9 Car Charger Bluetooth Headset – Deal at $27.99! 49) Everything There is to Know About Real-Time Apps!